There are not many puddings that can be breakfast or dessert but this is one of them. 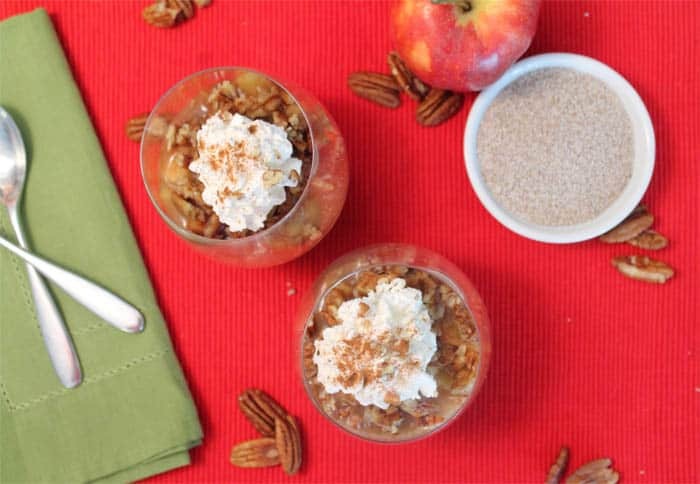 Apple Pecan Chia Seed Pudding is flavored with maple syrup and apple cider and topped with cinnamon apples and pecans for the ultimate sweet healthy treat. Wow! This past month has gone by so quickly and it’s time again for our Secret Recipe Club reveal. SRC, as we like to call it, is a Secret Santa recipe exchange where everyone is assigned a blog and gets to choose any recipe from that member’s blog to make & write something about. This month I received CJ’s blog, Morsels of Life. Now here’s a girl that loves to cook and use the KISS method (you know, keep it simple). She calls it being lazy, er, or efficient. 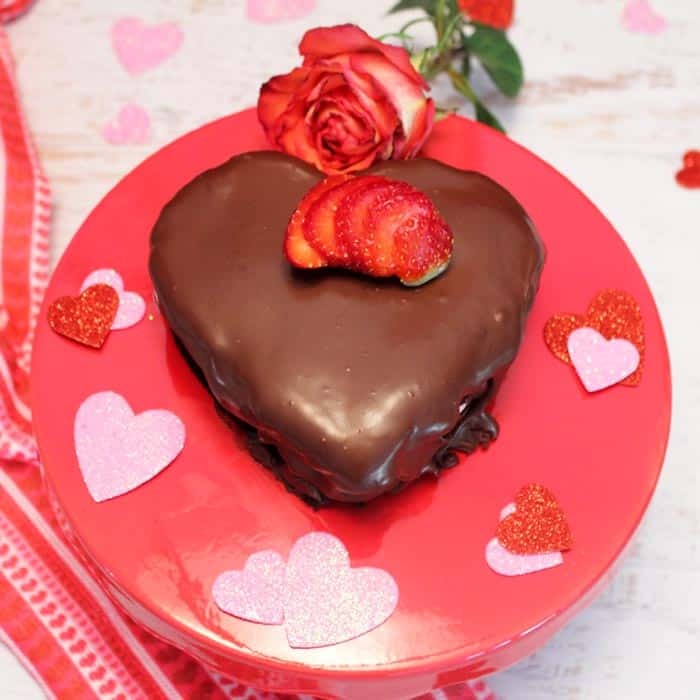 🙂 She runs a linky party every Monday called Inspire Me Monday which includes both recipes and DIY and looks like a great party to join. 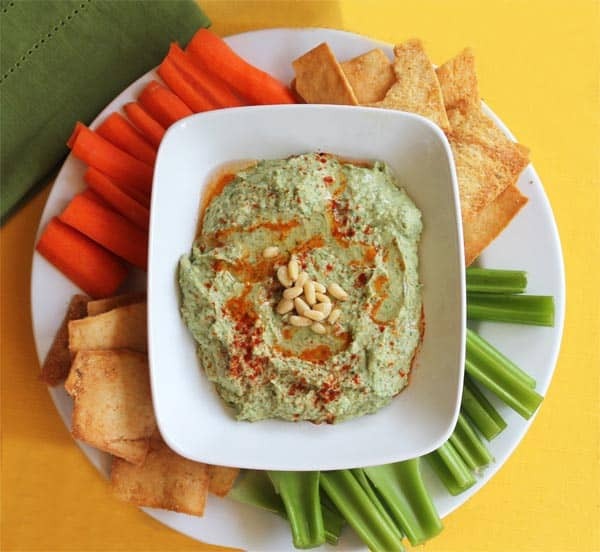 I enjoyed looking through CJ’s recipes that cover everything from apps to meals and snacks to desserts. My first thought was to make her Sweet Potato Soup (’cause sweet potatoes are one of my favorites) but I had just finished making my Chicken Corn Chowder and wasn’t in the mood for another soup, so I saved it to go back to when the weather turns cooler here. I also thought about trying my hand at her Pumpkin Bread Pudding (I’ve never made it either CJ) but with Choctoberfest upon us there were enough sweets in the house. So I bet you are wondering what my ultimate choice was – it was a healthy & totally delicious Pecan Chia Pudding. I opted for this pudding because I love recipes that can be used for dual purposes, in this case, either a breakfast dish or a tasty dessert. And it’s healthy to boot! Chia seeds are excellent sources of dietary fiber, omega 3’s and protein while milk satisfies the calcium angle and the apple provides an ample supply of Vitamin C. Doesn’t that sound like a great way to start your day? I did change her recipe up a little, with it being fall and all, and added some apple cider in lieu of some of the milk as well as cinnamon-sugar apples. 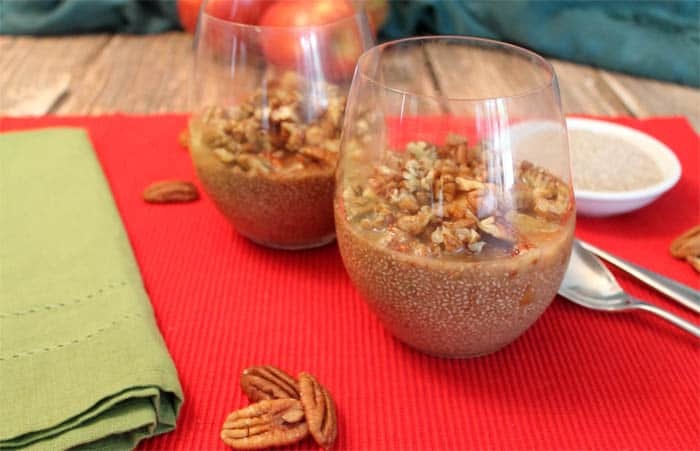 Let me tell you, this was one awesome Apple Pecan Chia Pudding! Even my husband, who is not a chia lover by the furthest stretch of the imagination, loved it. He had it for dessert one night and I saved mine for a quick and easy breakfast. Craving some new dishes? Take a little time and check out the delicious recipes below from the rest of our Secret Recipe Club members. There are not many puddings that can be breakfast or dessert but this is one of them. 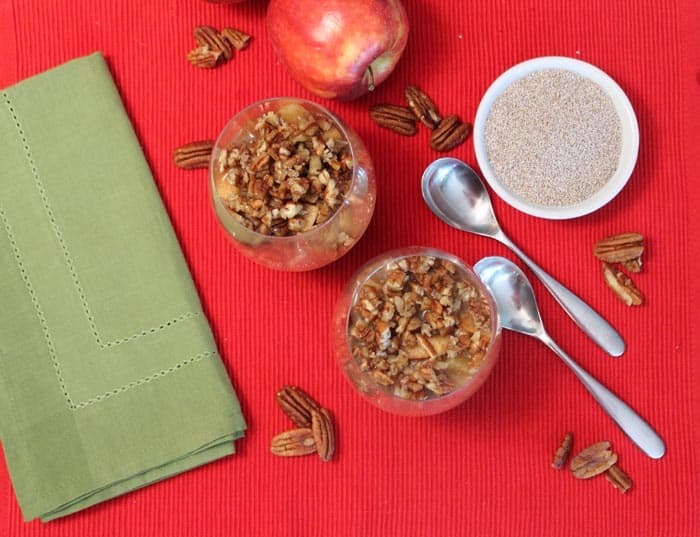 Apple Pecan Chia Pudding is flavored with maple syrup & apple cider then topped with cinnamon apples & pecans for a sweet healthy treat. Combine milk, cider, chia seeds, 2 tablespoons maple syrup, cinnamon and vanilla in a small bowl. Divide mixture evenly and pour into 2 serving dishes. Place in refrigerator for at least 1 hour. Stir halfway through so it doesn’t clump. 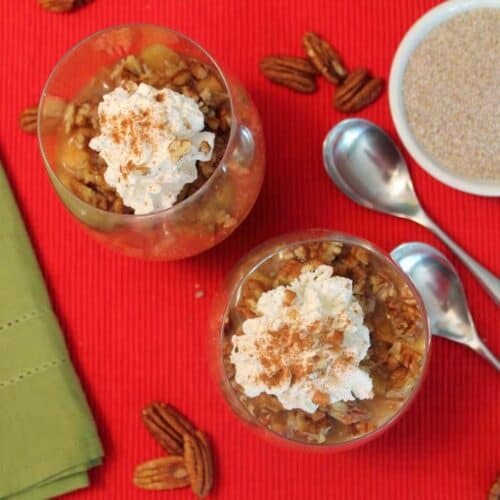 Combine pecans with remaining syrup and set aside. Prepare apples by placing in small microwave-safe dish, sprinkle with cinnamon-sugar mixture then cook in microwave for 1-2 minutes. 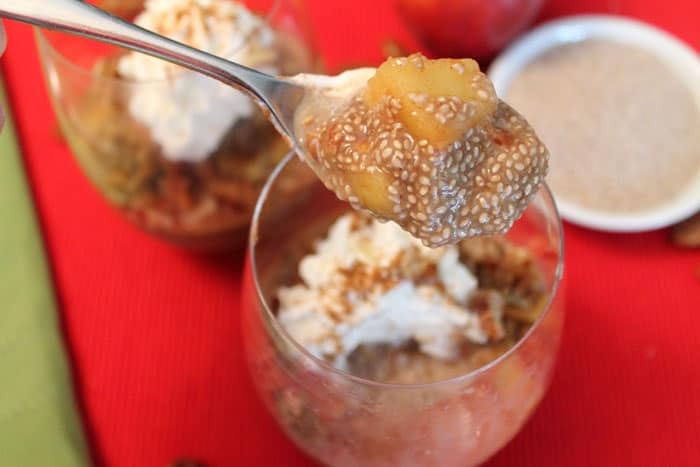 Once chia pudding has started to gel, divide apples and place on top of pudding then finish with pecans. Place back in refrigerator for overnight. Great for breakfast or even dessert. Make your own cinnamon sugar mixture by combining 1/4 cup granulated sugar with 3-4 teaspoons ground cinnamon. oh yum! i absolutely love this! This sounds wonderful. I would like it for breakfast please. I’m so glad you liked it. 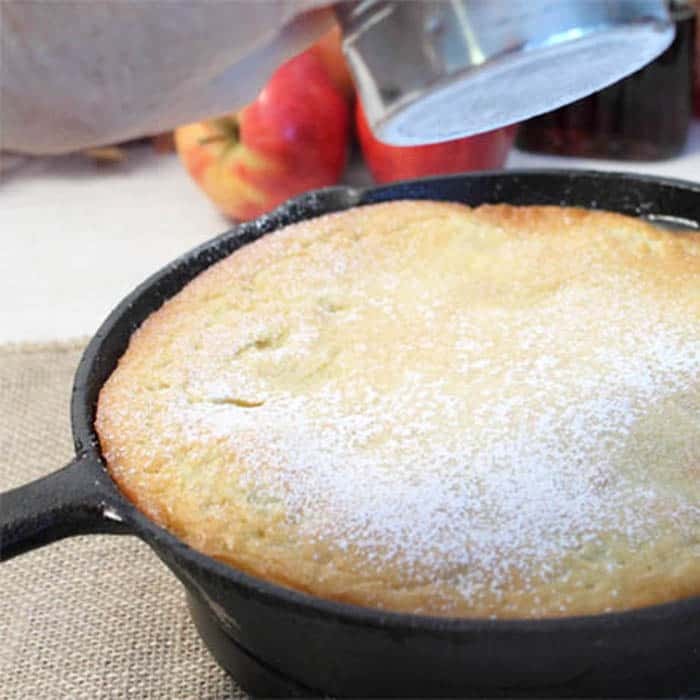 It helps to start with a great recipe like yours and I enjoyed making it a seasonal pudding. This looks delicious, and I love chia seeds. Me too Jean! I’m a sucker for chia seeds and anything made with them. You have upped the chia pudding game! This looks fantastic! Thanks Tracy! It really was delicious! I’ve been very curious about chia pudding, and this one looks delicious! Great job! You should try it out. Just add your favorite ingredients as chia seeds tend to take on the flavors of what you add to it.